Last Friday I went to the Provo Sensuous for a hot four inch Satisfier with cream cheese and BBQ sauce. I rotate between this sandwich, the Spicy Enticer (also with cream cheese) and the Sensuous. I sure do love these sandwiches - have for years. 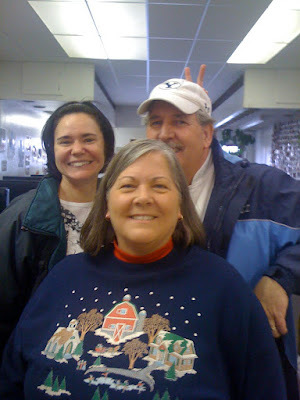 Anyway, I ran into my old boss, Janet and her husband - they eat there every Friday. I joined them for lunch and we reminisced about the old days at the BYU Bookstore Text Information Desk. Yes you read that right, a half marathon. Moab in March - not too far away. I've never run more than four miles. Needless to say, I'm a bit scared about this commitment. People, I'm going to need your prayers. Please share with me Almond's tricks. I could use some, too. Please tell me that one of these tricks involves eating sensuous sandwiches. I'm going to have to say that Almond is pretty much the coolest name I have heard of late. I ran a Relay in October and I had to run two legs, one 3.5 miles and the other 4.5 miles. Eight miles in one day was HARD. I can't imagine a half marathon! I'll be praying for you and cheering you on...from a distance. You can DO IT. It is so much fun to run a half marathon (sure not the first one, but all of those you run after the first one are loads of fun).